Most Recommended Garbage Removal Alternative & Trash Hauling Service Company in Tulsa. More than you expected at Crazy Good Prices. 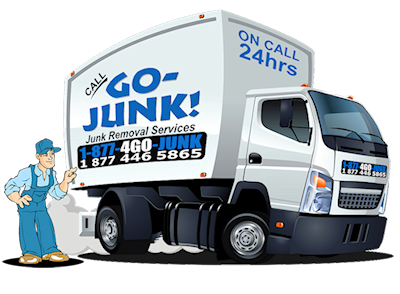 Give us a call and we'll haul it all away - Why go through the hassles of dealing with garbage removal alternative yourself? Our uniformed crew has the tools and equipment to get the job done right and on time. Don't waste money on dumpster rental and pay to load it yourself. Our crew is fast and efficient and can have your unwanted items removed quickly. Give us a call and we'll haul it all! I am a senior and Go-Junk helped me haul off my old refrigerator. Thank you. Go-Junk came and demolished my crumbling shed. They cleared it out and hauled it off. I am not in the dog house with my wife anymore thanks to Go-Junk. Flooded Basement from water heater. Go-Junk came and cleared out everything including the old hot water tank! Will recommend. Go-Junk got that old truck out of here. Thanks Go-Junk. Quick and professional! Go-Junk got that old hot tub out of my way! Got a new TV, Go-Junk hauled off my old one just in time for my Super Bowl party. Will use again. I got my garage back thanks to Go-Junk. Cleared out the old tires. Fast and reliable. Professional and helpful. Will use again. They hauled off the debris and old tree out of my yard quick and fast. Without Go-Junk my outside wedding would have never happened. They cleaned up the yard. Weekend project hero Go-Junk! Hauled off the old carpet to allow our floors to be refinished. Quick and funny! Removed my old pop up camper. Better than a dumpster. Painless and professional. Very nice and helpful. Helped me clear up parents hoarder estate. Rental house nightmare disappeared when Go-Junk arrived. Hauled off my old non working Freezer will use again. Go-Junk cleared out my garage of all my ex-husband's junk.